Sy Smith’s latest album, the self-written and self-produced “Sometimes A Rose Will Grow In Concrete”, has garnered the artist not only critical acclaim (she was nominated for 3 Soultracks Awards, among other acknowledgements), but it has also solidified her standing among an elite group of internationally-recognized women who are triple threats: singers/songwriters/producers. Her career has spanned almost 20 years and her resume boasts all the bullet points of a respected veteran. This daughter of Promise Land moved to Los Angeles after graduating from Howard University and quickly became the go-to girl for supporting vocals. Having a voice that spans a Minnie Riperton-esque soprano but easily rides a funk pocket like Sly Stone, Sy has a musical flexibility that’s allowed her to play with an extremely wide array of artists. She began her musical career touring with Whitney Houston and went on to sing with the likes of Chaka Khan, Meshell Ndegeocello, Sheila E., Usher, DJ Quik, The Foreign Exchange and many more. While doing this, Sy became a driving force in the independent soul movement on the west coast, releasing four solo albums and a live DVD (featuring her former band members Thundercat and Kamasi Washington) to critical acclaim. Her music quickly became a major staple in the underground soul scene and she has taken her sound to such mainstream outlets as The Tonight Show, The Mo’Nique Show and the legendary Carnegie Hall where she recently paid tribute to iconic women of jazz. Sy is also a featured guest of Grammy-winning jazz trumpeter Chris Botti (as seen on his Grammy-nominated “Live In Boston” DVD and his latest “Great Performances” concert on PBS) with whom she currently tours performing almost 150 shows yearly! Sy is pleased to spend an evening at the Renaissance Center where she’ll join family and friends for a very special fundraiser benefiting Promise Land Heritage Association. For this special engagement, Sy will perform many of her original compositions (she’s an Emmy-nominated songwriter) from her 5-album catalog, as well as some inspired covers paying homage to the voices that have influenced her. Get your tickets now. 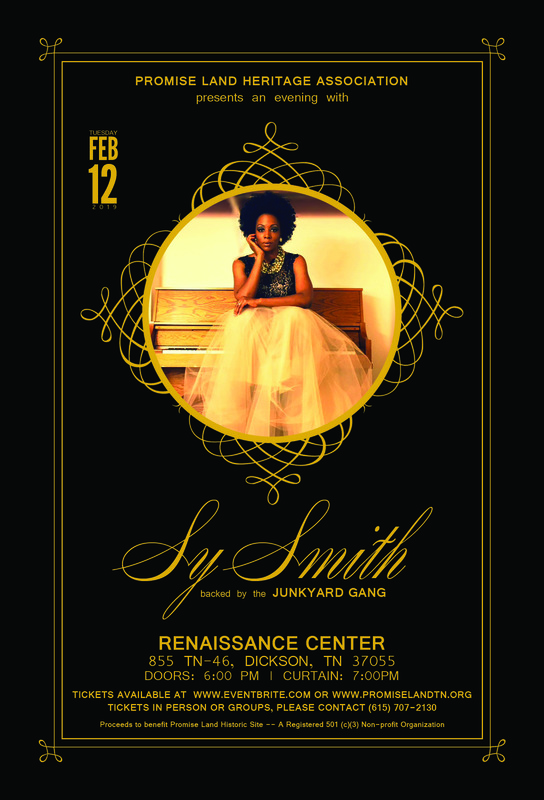 You won’t want to miss this historical show or this rare opportunity to experience An Evening With Sy Smith!